The SEC announced that it reached a settlement agreement related to civil charges that it brought against Teva Pharmaceuticals (“Teva” or the “Company”) for committing foreign bribery, in violation of the Foreign Corrupt Practices Act (“FCPA”). Teva also entered into a deferred prosecution agreement with the U.S. Department of Justice in connection with criminal charges related to the foreign bribery. 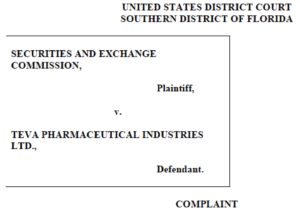 In its court Complaint, the SEC charged Teva with foreign bribery for payments that Teva made to government officials of Russia, Ukraine, and Mexico. The foreign bribery payments were allegedly made to those officials to influence regulatory and formulary approvals, drug purchasing decisions, prescription decisions, and to increase Teva’s market share and develop competitive advantages over its competitors. Because of those foreign bribes, Teva purportedly obtained business resulting in over $200 million of profits. The SEC further asserted that senior executives of the Company knowingly and/or willfully disregarded signs that the payments were being made as bribes to the foreign government officials. As we allege in our complaint, many of these bribes were concealed as legitimate payments to distributors. While distributors can help companies navigate complex regulatory environments and provide valuable industry relationships, they also can create significant corruption risks for companies. As alleged in our complaint, Teva failed to devise and maintain proper internal accounting controls to prevent the companyʼs payments of bribes to win business in certain regions around the globe.